It’s a question we hear debated regularly: which tennis player is the greatest of all time? After discovering the remarkable story of Esther Vergeer only last night, there is no doubt in my mind that she surpasses the likes of Roger Federer and Steffi Graf in the list of contenders. 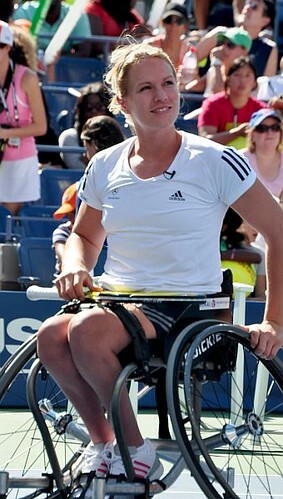 Having been diagnosed with paraplegia at the age of eight, the Dutchwoman has an unrivaled record in wheelchair tennis. She’s won a total of 39 Grand Slam titles, held the world number one ranking for 13 years, went 26 months without dropping a set in the mid-2000’s and is currently on a 444 match winning streak in singles. Some tennis fans will already know of the now 30-year-old in some capacity but with records spanning into the 20th century it surprised me to learn of her so late. Even non-sport fans know who Federer is so you’d expect a CV like hers to make her a household name. Unfortunately though, she remains a cult figure rather than a pioneer for disabled athletes, sports and events. Although she’s amassed over 5,000 followers on Twitter it doesn’t seem enough when you compare her to other successful disabled athletes. Oscar Pistorius is probably the most famous disabled athlete in the world and has nearly 30,000 followers. Baroness Tanni Grey-Thompson perhaps holds that acclaim in the UK with just over 11,000. Surely Vergeer deserves to be on a par with them. Thankfully, more people are starting to take note of her amazing dominance. Novak Djokovic had his photo taken with her in a recent tweet mentioning she’d not lost a match since 2003, which had me in utter disbelief. Then I found a video of her doing the Australian Open’s ‘Open Drive’ where I truly understood the scale of her achievements. Along with her array of Grand Slam titles (which could have been more if Wimbledon held a wheelchair singles event) Vergeer has won five Paralympic gold medals thus far and will be chasing more when she comes to London this summer. One hopes the world will take note this time and with more support from names such as Djokovic, she can receive just recognition and give wheelchair tennis a louder voice whilst enhancing her legacy further. Take a look at Petra Kvitova here. There’s fire in her eyes, passion in her stance and pride all over to be wearing the flag of her native Czech Republic. That could have been one of many images from the WTA’s galleries displaying such hunger and desire to succeed at last week’s Fed Cup. The reason I mention it is due to a recent encounter on our university’s student radio sports show. They drafted me in as a tennis ‘expert’ to discuss the ATP World Tour Finals and the topic of Davis Cup came up. Surprisingly I heard some resentment for what many believed was a format designed to make an individual sport a team game. It could have been hot air in order to provoke debate but it will be hugely disappointing if the majority of tennis fans dislike the Davis Cup as that’s considered in a far higher regard than it’s female equivalent the Fed Cup. At the start of the year when sporting calendars are out in every newspaper, the Fed Cup final didn’t even get a look-in. Perhaps us Brits aren’t used to success and seeing us fail in another form of tennis is too much to take but our new-look team gives me reason to believe they’ll turn things around. Captain Judy Murray (aka Judmoo) has so far guided a strong field of female players both experienced and youthful to the play-offs of World Group II. Although Elena Baltacha and Anne Keothavong don’t have too long left in their careers they could leave the British team in a very strong position for Heather Watson and Laura Robson. It’s not just my own country that gets me interested in the Fed Cup though. The idea of a World Cup-style tennis tournament every year is incredibly exciting, particularly as the current teams are only going to get better. Russia is always churning out top professionals and choosing just five players is the toughest decision of all. Germany’s strength in depth is also impressive whilst the camaraderie in the camp shown across the board makes it a pleasure to watch. The trouble is, players often see the Fed Cup as less important. The Williams sisters have only returned to play for the USA this year in order to qualify for the Olympic Games. For the other three years there’s a significant lack of participation from the world’s elite players, which I’m more disappointed than angry about. It’s the same with the Hopman Cup which I also believe is a great concept. Look at these photos and tell me it’s not worth participating in. If everyone gave as much as Kvitova up top then we could have a tournament which is the highlight of any tennis season. As the tennis world congregates to Melbourne Park for the first major of the year, one woman is about to embark on a journey she’s been preparing for her whole life. Melinda Samson will be doing the tennis fan grand slam in 2012, the year of her 40th birthday, which involves attending all four Grand Slam tournaments in Melbourne, Paris, London and New York. 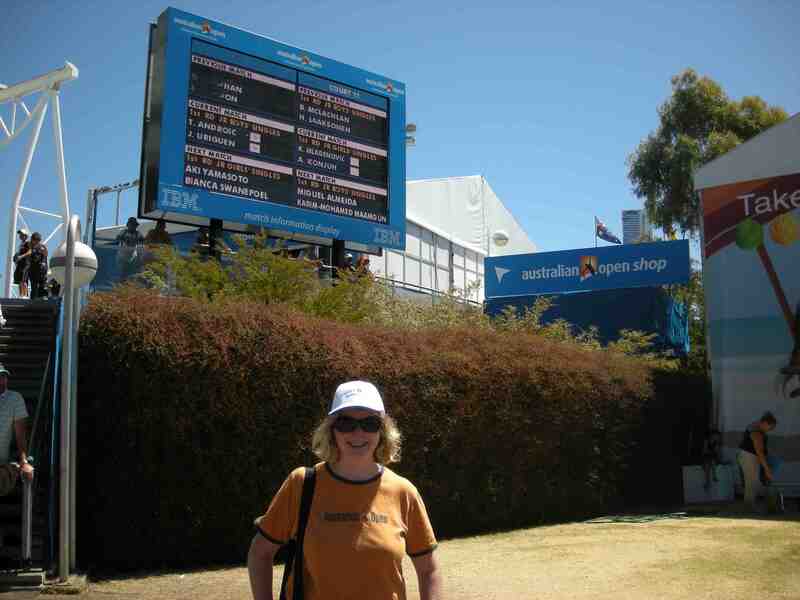 Tennis fans worldwide dream of such an experience but for Mel, it was always when and not if. She said: “It was about 12 years ago when I thought, you know what, I love travelling and I love tennis so when I’m 40 I’ll go to all the tennis Grand Slam events. It was always a thing I was going to do. Having been to 13 Australian Opens so far, those plans hopefully include getting tickets for Wimbledon and the French Open using her Aussie Open membership but she’s willing to make sacrifices in order to fulfil her destiny. In her day-to-day life, Mel is a self-employed search engine marketer, a career path she decided on in order to do the fan grand slam. Along the way she intends to blog her experiences under the pseudonym ‘Grand Slam Gal’. She’ll be expressing her thoughts on matches, the culture of the cities and also giving useful advice and tips for attending the Australian Open, French Open, Wimbledon or US Open. Mel previously lived in Traralgon before heading two hours down the road to study at Melbourne University. She’s been a resident of the host city ever since then, going to her first Aussie Open in 1989. Accompanying her on the journey will be her partner Andrew, who’s own nickname is ‘Ball Boy’. With Andrew being from the UK, they’ll base themselves there between the French Open in May and Wimbledon in June. They’ll then fly back to Victoria for a month’s stay before heading to the US Open in mid-August to complete their dream year. Of the four majors, Mel and Andrew have attended over 20 events between them but have never been to Flushing Meadows. Despite looking forward to the sights and sounds of the Big Apple, Mel is still certain what her favourite slam is. “I’d have to say the Australian Open and I think even when I’ve been to them all I’ll still say that. Obviously it’s in Melbourne, it’s my hometown and I’m so proud of what a great experience Tennis Australia and Melbourne puts on for everyone who goes. You can follow Mel’s journey across the globe at www.grandslamgal.com or follow her on Twitter @GrandSlamGal.